The final piece of funding for a state-of-the-art activity play park at Calderglen Country Park has been secured. A renewable energy grant to town charity, East Kilbride Community Trust (EKCT), will see building work on the £353,388 project start in February and be completed by May. The old adventure playground in Calderglen will be removed and new fully inclusive play equipment, which will also be suitable for children with additional needs, installed. EKCT and South Lanarkshire Council jointly compiled a questionnaire in 2013 which confirmed support for an activity play area in the park and identified the most popular types of play equipment. The plans have been given the seal of approval by the parents of the disabled children’s group, Information for Carers of Children with Additional Needs (ICCAN). The £40,000 grant from West Browncastle Renewable Energy Fund is in addition to confirmed funding of £241,338 from South Lanarkshire Council and Sport Scotland. Funding applications have also been submitted to Viridor and Biffa for the balance of £72,000. The grant was confirmed in a report to the council’s Enterprise Committee and comes just a few weeks after the News handed over a 600-strong ‘Kids Need to Play’ campaign petition to the council, demanding improvements at run down play parks. As part of the Calderglen project a new accessible pathway will be created. There will be safe surfacing under all equipment, tactile and acoustic play equipment targeted specifically for children with special needs, toddler and junior play equipment, group play activity space and seating for parents to supervise their children. East Kilbride East councillor John Cairney said: “This is a long overdue project and it is to be warmly welcomed. “It will be backed to the hilt by the thousands of families who use the park from throughout the town and beyond. “This is the way ahead for improving play parks. “The council and community groups have to work with each other to put together the necessary funding because great new facilities like this do not come cheap. “I have wanted to see improvements at Calderglen for a long time and I am delighted that the efforts of everyone involved in this have paid off. 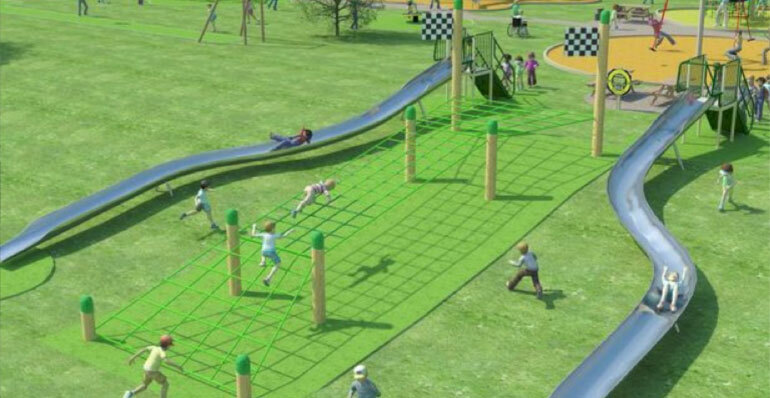 Depute chair of enterprise, Councillor Graham Simpson, who recently helped secure an upgrade of a Mossneuk play park, said: “This is a fantastic project and shows how, by working with community groups, the council can pull in funding for schemes it otherwise would not be able to afford. “Calderglen has been crying out for this sort of investment and I am delighted the funding is now in place.